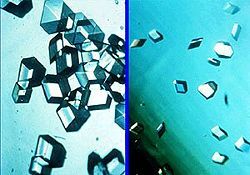 Comparison of insulin crystal growth in outer space (left) and on Earth (right). NASA image. Space manufacturing involves the production of manufactured goods in an environment outside a planetary atmosphere. Typically, it includes conditions of microgravity and hard vacuum. Manufacturing in space has several potential advantages over Earth-based industry. For instance, the space environment may allow one to perform industrial processes that cannot be readily reproduced on Earth, and potentially hazardous processes with minimal risk to the planetary environment. Also, it may be possible to collect and process raw materials from other bodies within the Solar System at a lower cost than that of lifting materials into orbit. Economic requirements of space manufacturing imply a need to collect the requisite raw materials at a minimum energy cost. Once the heavy capital costs are paid, the production will need to be economically profitable to become self-sustaining and beneficial to society. During the Soyuz 6 mission, Russian astronauts performed the first welding experiments in space. Three different welding processes were tested using a hardware unit called Vulkan. The tests included welding aluminum, titanium, and stainless steel. The Skylab mission, launched in May, 1973, served as a laboratory to perform various space manufacturing experiments. The station was equipped with a materials processing facility that included a multi-purpose electric furnace, a crystal growth chamber, and an electron beam gun. Among the experiments to be performed was research on molten metal processing; photographing the behavior of ignited materials in zero-gravity; crystal growth; processing of immiscible alloys; brazing of stainless steel tubes, electron beam welding, and the formation of spheres from molten metal. The crew spent a total of 32 man-hours on materials science and space manufacturing investigation during the mission. 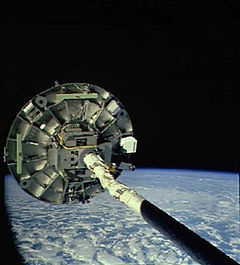 The Wake Shield Facility is deployed by the Space Shuttle's robotic arm. NASA image. The Space Studies Institute began hosting a bi-annual Space Manufacturing Conference in 1977. Microgravity research in materials processing continued in 1983, using the Spacelab facility. This module has been carried into orbit 26 times aboard the Space Shuttle, as of 2002. In this role the shuttle has served as an interim, short-duration research platform in lieu of the upcoming International Space Station. In February 1994 and September 1995, the Wake Shield Facility was carried into orbit by the Space Shuttle. This demonstration platform used the vacuum created in the orbital wake to manufacture thin films of gallium arsenide and aluminum gallium arsenide. On May 31, 2005, the recoverable, unmanned Foton-M2 laboratory was launched into orbit. Among the experiments were crystal growth and the behavior of molten-metal in weightlessness. The International Space Station is expected to provide expanded and improved facilities for performing industrial research. These will lead to improvements in our knowledge of materials sciences, new manufacturing techniques on Earth, and potentially some important discoveries in space manufacturing methods. The completion of this facility has been delayed due to safety problems with the Space Shuttle. The Material Science Laboratory Electromagnetic Levitator (MSL-EML) on board the Columbus Laboratory is a science facility that can be used to study the melting and solidification properties of various materials. The Fluid Science Laboratory (FSL) will be used to study the behavior of liquids in microgravity. There are several unique differences between the properties of materials in space compared to the same materials on the Earth. These differences can be exploited to produce unique or improved manufacturing techniques. The microgravity environment allows control of convection in liquids or gasses, and the elimination of sedimentation. Diffusion becomes the primary means of material mixing, allowing otherwise immiscible materials to be intermixed. The environment allows enhanced growth of larger, higher-quality crystals in solution. The ultraclean vacuum of space allows the creation of very pure materials and objects. The use of vapor deposition can be used to build up materials layer by layer, free from defects. Surface tension causes liquids in microgravity to form perfectly round spheres. This can cause problems when trying to pump liquids through a conduit, but it is very useful when perfect spheres of consistent size are needed for an application. Space can provide readily available extremes of heat and cold. Sunlight can be focused to concentrate enough heat to melt the materials, while objects kept in perpetual shade are exposed to temperatures close to absolute zero. The temperature gradient can be exploited to produce strong, glassy materials. For most manufacturing applications, specific material requirements must be satisfied. Mineral ores need to be refined to extract specific metals, and volatile organic compounds will need to be purified. Ideally, these raw materials are delivered to the processing site in an economical manner, where time to arrival, propulsion energy expenditure, and extraction costs are factored into the planning process. Minerals can be obtained from asteroids, the lunar surface, or a planetary body. Volatiles could potentially be obtained from a comet or the moons of Mars or other planets. It may also prove possible to extract hydrogen from the cold traps at the poles of the Moon. Another potential source of raw materials, at least in the short term, is recycled orbiting satellites and other man-made objects in space. Some consideration was given to the use of the Space Shuttle external fuel tanks for this purpose, but NASA determined that the potential benefits were outweighed by the increased risk to crew and vehicle. Unless the materials processing and the manufacturing sites are co-located with the resource extraction facilities, the raw materials will need to be moved about the solar system. There are several proposed means of providing propulsion for this material, including solar sails, magnetic sails, mini-magnetospheric plasma propulsion (which uses a cloud of ionized gas as a magnetic sail), electric ion thrusters, or mass drivers (this last method uses a sequence of electromagnets mounted in a line to accelerate a conducting material). At the materials processing facility, the incoming materials will need to be captured by some means. Maneuvering rockets attached to the load can park the content in a matching orbit. Alternatively, if the load is moving at a low delta-v relative to the destination, then it can be captured by means of a mass-catcher. This could consist of a large, flexible net or inflatable structure that would transfer the momentum of the mass to the larger facility. Once in place, the materials can be moved into place by mechanical means or by means of small thrusters. Materials can be used for manufacturing either in their raw form, or by processing them to extract the constituent elements. Processing techniques include various chemical, thermal, electrolitic, and magnetic methods for separation. In the near term, relatively straightforward methods can be used to extract aluminum, iron, oxygen, and silicon from lunar and asteroidal sources. Less concentrated elements will likely require more advanced processing facilities, which may have to wait until a space manufacturing infrastructure is fully developed. Some of the chemical processes will require a source of hydrogen for the production of water and acid mixtures. Hydrogen gas can also be used to extract oxygen from the lunar regolith, although the process is not very efficient. So a readily available source of useful volatiles is a positive factor in the development of space manufacturing. One proposed method of purifying asteroid materials is through the use of carbon monoxide (CO). Heating the material to 500 °F (260 °C) and exposing it to CO causes the metals to form gaseous carbonyls. This vapor can then be distilled to separate out the metal components, and the CO can then be recovered by another heating cycle. Thus an automated ship can scrape up loose surface materials from, say, the relatively nearby 4660 Nereus (in delta-v terms), process the ore using solar heating and CO, and eventually return with a load of almost pure metal. The economics of this process can potentially allow the material to be extracted at one-twentieth the cost of launching from Earth, but it would require a two-year round trip to return any mined ore.
Due to speed of light constraints on communication, manufacturing in space at a distant point of resource acquisition will either require completely autonomous robotics to perform the labor, or a human crew with all the accompanying habitat and safety requirements. If the plant is built in orbit around the Earth, or near a manned space habitat, however, telecheric devices can be used for certain tasks that require human intelligence and flexibility. Solar power provides a readily available power source for thermal processing. Even with heat alone, simple thermally-fused materials can be used for basic construction of stable structures. Bulk soil from the Moon or asteroids has a very low water content, and when melted to form glassy materials is very durable. These simple, glassy solids can be used for the assembly of habitats on the surface of the Moon or elsewhere. The solar energy can be concentrated in the manufacturing area using an array of steerable mirrors. The availability and favorable physical properties of metals will make them a major component of space manufacturing. Most of the metal handling techniques used on Earth can also be adopted for space manufacturing, but a few will need significant modifications. The microgravity environment of space will necessitate modifications to some metal handling techniques. The production of hardened steel in space will introduce some new factors. Carbon only appears in small proportions in lunar surface materials and will need to be delivered from elsewhere. Waste materials carried by humans from the Earth is one possible source, as are comets. The water normally used to quench steel will also be in short supply, and require strong agitation. Casting steel can be a difficult process in microgravity, requiring special heating and injection processes, or spin forming. Heating can be performed using sunlight combined with electrical heaters. The casting process would also need to be managed to avoid the formation of voids as the steel cools and shrinks. Various metal-working techniques can be used to shape the metal into the desired form. The standard methods are casting, drawing, forging, machining, rolling, and welding. Both rolling and drawing metals require heating and subsequent cooling. Forging and extrusion can require powered presses, as gravity is not available. Electron beam welding has already been demonstrated on board the Skylab, and will probably be the method of choice in space. Machining operations can require precision tools which will need to be imported from the Earth for some duration. New space manufacturing technologies are being studied at places such as Marshall's National Center for Advanced Manufacturing. The methods being investigated include coatings that can be sprayed on surfaces in space using a combination of heat and kinetic energy, and free-form fabrication of parts. Approaches such as these, as well as examination of material properties that can be investigated in an orbiting laboratory, will be studied on the International Space Station. As the infrastructure is developed and the cost of assembly drops, some of the manufacturing capacity can be directed toward the development of expanded facilities in space, including larger scale manufacturing plants. These will likely require the use of lunar and asteroid materials, and so follow the development of mining bases. Rock is the simplest product, and at minimum is useful for radiation shielding. It can also be subsequently processed to extract elements for various uses. Water from lunar sources, Near Earth Asteroids or Martian moons is thought to be relatively cheap and simple to extract, and gives adequate performance for many manufacturing and material shipping purposes. Separation of water into hydrogen and oxygen can be easily performed in small scale, but some scientists believe that this will not be performed on any large scale initially due to the large quantity of equipment and electrical energy needed to split water and liquefy the resultant gases. Water used in steam rockets gives a specific impulse of about 190 seconds; less than half that of hydrogen/oxygen, but this is adequate for delta-v's that are found between Mars and Earth. Water is useful as a radiation shield and in many chemical processes. Ceramics made from lunar or asteroid soil can be employed for a variety of manufacturing purposes. These uses include various thermal and electrical insulators, such as heat shields for payloads being delivered to the Earth's surface. Metals can be used to assemble a variety of useful products, including sealed containers (such as tanks and pipes), mirrors for focusing sunlight, and thermal radiators. The use of metals for electrical devices would require insulators for the wires, so a flexible insulating material such as plastic or fiberglass will be needed. A notable output of space manufacturing is expected to be solar panels. Expansive solar energy arrays can be constructed and assembled in space. As the structure does not need to support the loads that would be experienced on Earth, huge arrays can be assembled out of proportionately smaller amounts of material. The generated energy can then be used to power manufacturing facilities, habitats, spacecraft, lunar bases, and even beamed down to collectors on the Earth with microwaves. Other possibilities for space manufacturing include propellants for spacecraft, some repair parts for spacecraft and space habitats, and, of course, larger factories. Ultimately, space manufacturing facilities can hypothetically become nearly self-sustaining, requiring only minimal imports from the Earth. The microgravity environment allows for new possibilities in construction on a massive scale, including megascale engineering. These future projects might potentially assemble space elevators, massive solar array farms, very high capacity spacecraft, and rotating habitats capable of sustaining populations of tens of thousands of people in Earth-like conditions. ↑ ESA, Columbus laboratory. Retrieved December 19, 2008. Cutler, Andrew H. 1985. "Metallurgical Properties of Lunar and Asteroidal Steels." In Faughnan, Barbara, and Gregg Maryniak (eds.). 1985. Space Manufacturing 5, Engineering with Lunar and Asteroidal Materials: Proceedings of the Seventh Princeton/AIAA/SSI Conference, May 8-11, 1985. New York, NY: American Institute of Aeronautics and Astronautics. Gump, David. 1990. Space Enterprise: Beyond NASA. New York, NY: Praeger Publishers. ISBN 0275933148. Heppenheimer, T.A. 1977. Colonies in Space. Harrisburg, PA: Stackpole Books. ISBN 0811703975. Lewis, J., M.S. Matthews, and M.L. Guerrieri (eds.). 1993. Resources of Near-Earth Space. Tucson, AZ: University of Arizona Press. ISBN 9780816514045. Retrieved December 19, 2008. PERMANENT — near-term space resource utilization. SKYLAB: A Guidebook (see Chapter 5, section 4). This page was last modified on 14 October 2015, at 16:12.